In 1964 at Yellowstone Lake was the first time I had met any Coast guardsmen. They gave a workshop and we became certified boat handlers. That did it I wanted coast Guard. The folks had a small 14 foot outboard boat which we used all the time in the lakes in Midwest City, Oklahoma. Many a fishing trip and later scuba diving help me decide if I had a choice I wanted either the Navy or Coast Guard. My senior year of high school saw many friend joining one of the four branches of the military but those were the only four they knew about but I was interested in the fifth- Coast Guard. I had obtained an application which I keep until my senior year in college and now was the time to pull it out and send it in. My dad, like all the other men in my family had served. Dad served in WWII in the Pacific on an aircraft carrier. My first Christmas found me in Cape Code, Massachusetts. With my little sailor suit. Just like dad! This was my direction, duty, and honor to serve. I would have to travel 100 mile on a Thursday to Tulsa, Oklahoma. There were no recruiter in Oklahoma, but one would be in a Federal building once a month on Thursday. So off I went to see If I could get in. The First Class Boatswain’s Mate told me that there was a waiting list of 7 months and they only took two men per month and was I still interested. Yes. I filled out the application and I turned it in. For the next 6 months I drove 100 miles to visit and see how things were going. I would have to travel to Kansas City to take test and then a civilian medical exam. It would take three days in KC before I could enlist. Then while in boot camp I would take another set of test to see which school I could chose after that. I did hear that the First Class boatswain’s Mate had been assigned to a ship in Alaska. On June 7, I was on my way to Cape May, New Jersey and a new adventure, one which would have a profound effect on the rest of my life. June, July and Aug. came boot camp. There I was introduced to my TI and many others that shaped my training. I was put in HOTEL Company. I served as the Chaplin representative and assistant Yeoman. Boot camp was just what I expected. Having been in Boy Scouting with all the skills earning my Eagle Badge helped with training . As the Chaplin representative, I met Mr. Ford. Yes Henry Ford’s son. He gave a sermon one time telling us that his dad at dinner one night wished that one of his sons would go into another field besides cars so they would have something different to talk about at dinner. 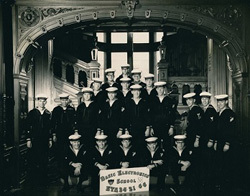 Mr. Ford was a Navy Chaplin on loan to the Coast Guard. After taking the tests I was given the choice of ‘A ‘ schools after boot camp and I chose electronics in Groton, Connecticut. The day after graduation two of us headed to Conn. 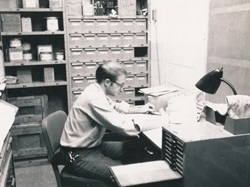 Starting in Sept. 1966 electronic school was a 5 day 8 hour per day 6 month course. This course set skills and training I would use throughout the rest of my life and career. Little did I know that the education was equal to another degree in electronic leading to understanding of computer. Again this was the best move I have ever made. After graduation in May 1967, I was shipped out to the Bahamas !!!! The station I was shipped to was on San Salvador Bahamas. Yes sounds great but was semi-isolated duty with one Palm tree! This was a LORAN (long range aid to navigation) station. The equipment was invented during WWII in 1943 so was about 20 years old. The signal is much like a lighthouse but electronic. My duty was from June 1967 to June 1968. While serving there I became a third Class Petty Officer. Many experiences living on an island with only native BWIs. Great fishing and plenty of sun. The Loran signal was used by all military and the public for navigation. No GPS at this time. Loran A still used tubes. Loran C was just being introduced which used transistors. I understand that Loran D was put into 18 wheel trucks in Viet Nam and Loran E was used in space which began GPS. These are photos of San Sal USCG. After one year I was shipped out back to the states. Cape San Blas, Fla.! Yes closer to towns but still 13 miles away. Again a Loran A station but with Radio Beacon and a working Lighthouse. I served there until I got out. In May 1970. The addition of Radio Beacon for navigation was really interesting. The Loran signal could go out 1,000 miles where as the Radio Beacon signal would tavel 250 miles and the lighthouse would travel 20 to 30 miles. 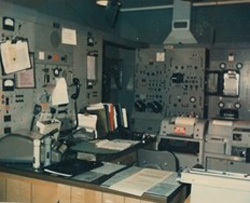 Every 4 hours we would use a TTY to report ship movement and weather reports. By 1972 most of the station had been replaced by off site switches and the station began to shut down. Loran A was out. But up to that time we were still used by the Coast Guard and other military units plus the fishing boats for location and fishing fields. So we were still part of the SAR team. A lot of these photos are from Cape San Blas. Lighthouse that was moved to a park in Port St. Joe, Florida. During my tour of duty, I was looking around for a direction and a career. Yes the Coast Guard would be a super career but for me I wanted to try teaching which would mean leaving the Coast Guard and attend school for a teaching certificate. I had a degree in Fine Art and during my stay in Cape San Blas I was able to do some art work and teaching. So I used my GI Bill to go back to school and start a teaching career. Little did I know that most of my career would be teaching electronics and computer! Thanks to the Coast Guard training and 3 years of hands on made a great foundation for teaching electronics and computers. There were two actions which made a profound change in my thinking. First was the skills and training that allowed me to keep an electronic station online which was used for navigation 24/7 and the confidence to do my assigned duties. The second event that showed me the other side of duty was when we came back into the states and landed at Miami airport and were spit on by citizens. Boot camp and TI Whinningham. Electronic School giving me a great education in Electronics which I used later in computers and programming. While stationed on San Sal. Five of use were to participate in a war game with the 80 man Navy base two miles away. Four Coast Guard men entered the base and was able to simulate taking out 60 or more men and I was to take down the backup communication and air strip one mile down the road. All very successful. Helped the Navy understand how to defend their base better. San Salvador and the raid on the NAVY Base 5 USCGs took down an 80 man base 🙂 Least: Also on San Sal. The isolation was hard to adjust to but with others help and team work we were able to help each other. No TV, no Radio except short wave at night, films once a week and mail flown in once a week. Serving with interesting people and helping us do a great job. Meeting some very interesting men and some of their families. Also the travel to different places. Finishing boot camp, I was in the best physical shape I have ever been. The finishing electronic school and working on a team to keep the navigation system running. The completion of my service to my country. And Service to my Country. The biggest impact was electronic school which gave me the training and the years of service changed my direction of teaching to include computers and programming. My TI in boot camp was one of the finest men I have ever met. First Class Boatswain’s Mate Whinningham. He became a friend and watching our company of young boys grew into men serving our country. Company HOTEL won several awards which he was proud. (a small tear in his eye when we said good by) Also working with Officer Chaplin Mr. Ford. He helped many men through trials during their stay in boot Camp. 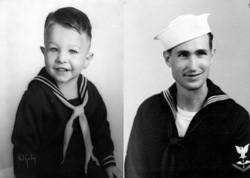 Another man was the First Class Petty Officer ET while serving on San Sal. The best electronic tech. I have every seen. 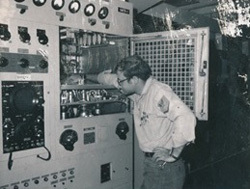 He shipped out to the Air Force to work on LAND LORAN which became GPS. Another event that was a fun adventure was on San Salvador the raid on a NAVY base to test their security which was a simple war game. Five of us raided their base and won over an 80 man base. Another standout was landing in Miami Airport and being spit on by my own country people I was serving. Not fun. The Coast Guard raid on the Navy base and five of use took the 80 man down. The raid on the NAVY base – war games. I am retired from teaching after teaching 17 years on high school 6 years in elementary and 12 years on the college level. Proud that i served and always mentioned to students that the military is an option they should consider for training, service, education and a career choice. Joined the Vietnam Vets which moved to the American Legion, at one time the VFW didn’t admit Vietnam Vets. Unable to enter the VA because of Social Security for the wife. You are joining a special team doing a very important job. Also if called on the work with other branches of the military you are a valuable member. We are all on the same team but you may be in contact with civilians more than other branches. Starting project working hard to complete and finishing. Serving others and their ideas and dreams. Working with all kids of people. As all services we are part of the military team. But each one feels theirs is special and the USCG is as well. We have a job to do and we do it well. Really enjoyed looking up the history of the Coast guard. Favorite ship USCG Bear. Proud to have been USCG. You are on a military team with special jobs to do.